Latitude: 37.912344. Longitude: 27.332818. 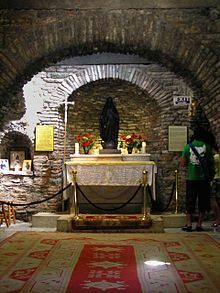 On the eastern slopes of Mount Koressos (Bulbul Dagi) four and a half miles south of Selcuk and the ancient, classical ruins of Efes (Ephesus) is Mary’s House, the place where the Blessed Virgin Mary came to live after the crucifixion of her son, Jesus. Today there is a Marian shrine here at Meryen Ana Evi and it is a place of ‘devout’ pilgrimage. About half a mile to the north on Meryen Ane Kilisesi road are the Byzantine ruins of The Church of the Virgin Mary (The Council Church), where it’s possible Mary also lived for a short time. The site is reached from the D550 heading south out of Selcuk from the Magnesia Gate, then by turning west onto the Meryem Ane Yolu road for another 4 miles up onto the wooded slopes of Mount Koressos and, the Church of the Virgin Mary and a little further on stands the much venerated Christian site called the House of the Virgin Mary. Here also is St Mary’s Well which is said to have healing properties. According to ‘the Legend’ and documentary evidence: Mary lived a ‘secluded’ life here for several years after accompanying St John from Jerusalem to Ephesus; she is said to have died at Meryen Ane, aged 64? St Paul also lived for a time in Ephesus. The Turkish coast lies 6 miles further to the west. The foundations of this building [Mary’s House] were discovered in the late 19th century after much painstaking work after the recordings (revelations) of a German nun, Blessed Catherine Emmerich (1774-1824), were revealed. She apparently had a vision of the Virgin Mary who informed her of the whereabouts of her home near Ephesus. Catherine recorded what Our Lady had told her in a book called ‘The Life of the Virgin Mary,’ which had been written in French. In 1891 a Lazarist priest and president of Izmir college decided to see if the location and validity of Mary’s house (as given in the nun’s revelations) held any real, accurate credence. Archaeologists searched the mountainside south of Ephesus for many years, but eventually they discovered foundations at Panayir Dagi on the slopes of Mount Bulbul, also called Mount Koressos. They first discovered a round-shaped cistern, an arched wall, and what may have been a pool but better still two clay sarcophagi were found, each containing a skeleton and burial gifts as well as two Roman coins, one of Constantine and the other of Justinian. Later, other foundations including some walls were excavated close by, and it was these that lead to the final discovery, Mary’s House. A date was arrived at somewhere between the 6th-7th centuries AD, but the discovery of pieces of coal and stonework gave a date of 1st century AD. A church-like building with a dome and cross-shaped plan was eventually built over these scant foundations, the old and new walls were marked with a red line so as to show which were the old 1st century walls. The author Selahattin Erdemgil in his book ‘Ephesus’ says: “An entrance with door-like niches on both sides, leads into a vaulted vestibule whence one enters the hall with an open apse. The statue of the Virgin Mary found in the apse, had been placed there about one hundred years ago. Since the grey area in front of the apse is different from the rest of the marble paved floor, it must have been the location of the hearth”. Erdemgil goes on to say “The small room in the south is known as the bedroom and there is an apsidal niche in its eastern wall.” Inscriptions on the wall are interpretations from the Koran relating to the Virgin Mary; Muslim people revere her and often come to pray in the little room. Outside, to the west a holy water fountain and St Mary’s Well which has long been able to cure the sick. 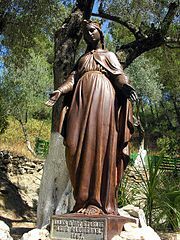 A beautiful statue of the Virgin Mary stands on a rock-base in the garden and, there is a Wall of Supplication. In recent times two popes have visited the shrine and proclaimed it as a place of Catholic pilgrimage. On The Feast of the Assumption 15th August pilgrims from all over the world visit the House of Mary in coach loads. Erdemgil, Selahattin., Ephesus, Net Tourist Yayinlar A.S, Istanbul, Turkey, 1986. Gumus, Dogan., Ancient Ephesus, DO-GU Yayinlari, Istanbul, 1996. Michael’s Guide, Turkey, Series ed. Michael Shicor, Inbal Travel Information Ltd., Tel Aviv, Israel, 1990. Categories: Ancient Churches / Chapels, St Mary's Church | Tags: House of the Virgin Mary near Ephesus Turkey, Mary's House on Mount Koressos in Turkey | Permalink.